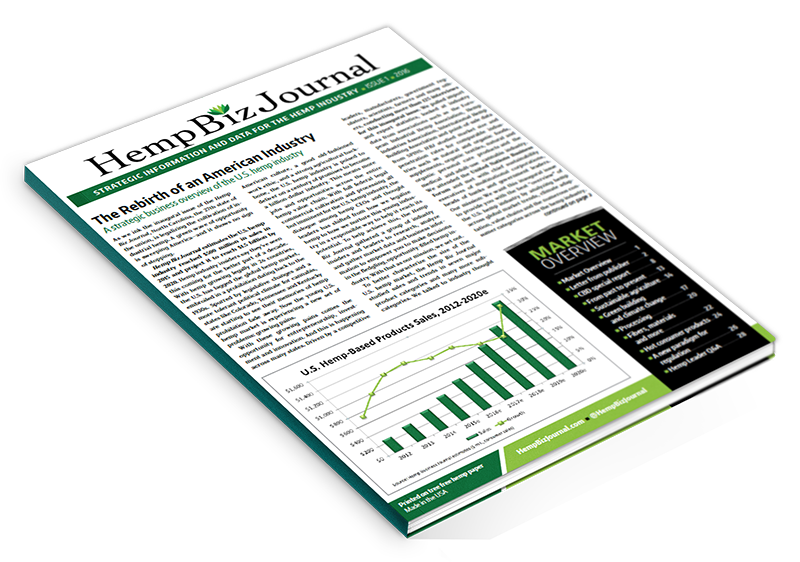 The Hemp Business Journal is the leading provider of data, market intelligence and strategic information for the hemp industry. Do you have the info you need to capitalize on the growth of the emerging hemp industry? The State of the Hemp Industry is the definitive source for market sizes and high-level analysis of business trends in an industry set for incredible growth. For the cost of one or two hours of a top expert’s time you get the benefit of hundreds of hours of research, hundreds of surveys of market participants, and in-depth interviews with the top business-people, all distilled down into the most actionable high-level analysis and the most trusted market numbers. The State of the Hemp Industry contains the high-level analysis needed for those looking to expand their business, makes investments, or raise capital. Hemp Biz Journal’s mission is to inform titans of industry, investors, and political leaders about industrial hemp through strategic market data, analysis, business intelligence, and how to use hemp as a foundational cash crop for economic, social and environmental progress. We believe that through hemp we can truly heal people and the planet—and make a tidy profit along the way. CFN Media (CannabisFN) is the leading creative agency and media network dedicated to legal cannabis. We help marijuana businesses attract investors, customers (B2B, B2C), capital, and media visibility. Private and public marijuana companies and brands in the US and Canada rely on CFN Media to grow and succeed. CFN launched in June of 2013 to initially serve the growing universe of publicly traded marijuana companies across North America. Today, CFN Media is also the digital media choice for the emerging brands in the space. Disclaimer: Matters discussed on this website contain forward-looking statements that are subject to certain risks and uncertainties that could cause actual results to differ materially from any future results, performance or achievements expressed or implied by such statements. Emerging Growth LLC dba TDM Financial, which owns CannabisFN, is not registered with any financial or securities regulatory authority and does not provide nor claims to provide investment advice or recommendations to readers of this release. Emerging Growth LLC dba TDM Financial, which owns CannabisFN, may from time-to-time have a position in the securities mentioned herein and will increase or decrease such positions without notice. The Information contains forward-looking statements, i.e. statements or discussions that constitute predictions, expectations, beliefs, plans, estimates, or projections as indicated by such words as "expects", "will", "anticipates", and "estimates"; therefore, you should proceed with extreme caution in relying upon such statements and conduct a full investigation of the Information and the Profiled Issuer as well as any such forward-looking statements. Any forward looking statements we make in the Information are limited to the time period in which they are made, and we do not undertake to update forward looking statements that may change at any time; The Information is presented only as a brief "snapshot" of the Profiled Issuer and should only be used, at most, and if at all, as a starting point for you to conduct a thorough investigation of the Profiled Issuer and its securities and to consult your financial, legal or other adviser(s) and avail yourself of the filings and information that may be accessed at www.sec.gov, www.pinksheets.com, www.otcmarkets.com or other electronic sources, including: (a) reviewing SEC periodic reports (Forms 10-Q and 10-K), reports of material events (Form 8-K), insider reports (Forms 3, 4, 5 and Schedule 13D); (b) reviewing Information and Disclosure Statements and unaudited financial reports filed with the Pink Sheets or www.otcmarkets.com; (c) obtaining and reviewing publicly available information contained in commonlyknown search engines such as Google; and (d) consulting investment guides at www.sec.gov and www.finra.com. You should always be cognizant that the Profiled Issuers may not be current in their reporting obligations with the SEC and OTCMarkets and/or have negative signs at www.otcmarkets.com (See section below titled "Risks Related to the Profiled Issuers, which provides additional information pertaining thereto). For making specific investment decisions, readers should seek their own advice and that of their own professional advisers. Emerging Growth LLC dba TDM Financial, which owns CannabisFN, may be compensated for its Services in the form of cash-based and/or equity-based compensation in the companies it writes about, or a combination of the two. For full disclosure, please visit: https://www.cannabisfn.com/legal-disclaimer/. A short time after we acquire the securities of the foregoing company, we may publish the (favorable) information about the issuer referenced above advising others, including you, to purchase; and while doing so, we may sell the securities we acquired. In addition, a third-party shareholder compensating us may sell his or her shares of the issuer while we are publishing favorable information about the issuer. Except for the historical information presented herein, matters discussed in this article contain forward-looking statements that are subject to certain risks and uncertainties that could cause actual results to differ materially from any future results, performance or achievements expressed or implied by such statements. Emerging Growth LLC dba TDM Financial, which owns CannabisFN, is not registered with any financial or securities regulatory authority, and does not provide nor claims to provide investment advice or recommendations to readers of this release. Emerging Growth LLC dba TDM Financial, which owns CannabisFN, may from time to time have a position in the securities mentioned herein and will increase or decrease such positions without notice. For making specific investment decisions, readers should seek their own advice and that of their own professional advisers. Emerging Growth LLC dba TDM Financial, which owns CannabisFN, may be compensated for its Services in the form of cash-based and/or equity- based compensation in the companies it writes about, or a combination of the two. For full disclosure please visit: https://www.cannabisfn.com/legal-disclaimer/.